A new computer system has been created that can estimate greenhouse gas emissions of American cities and even individual buildings. The software, developed by researchers from Arizona State University, USA, is much more powerful than previous programs that gave a broader estimation of carbon dioxide emission levels. The capabilities of the Hestia system that takes its name from the Greek goddess of the hearth and home, has been outlined in the latest issue of Environmental Science and Technology. 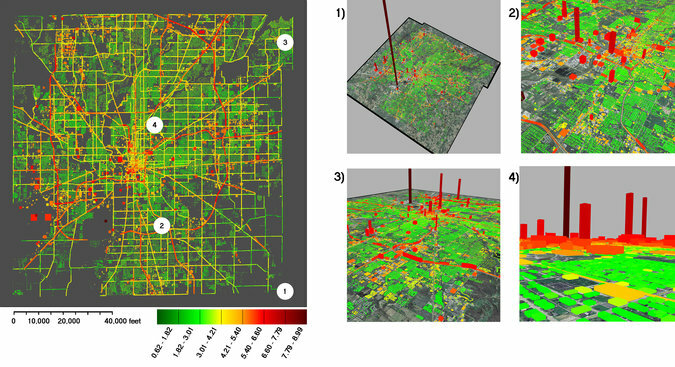 It takes information from the public database, uses traffic simulation and energy consumption modelling of individual buildings to create high-resolution maps that show the sources of greenhouse gas emissions. Kevin Gurney, associate professor in the in ASU's College of Liberal Arts and Sciences' School of Life Sciences, and senior scientist with the Global Institute of Sustainability, says, "Cities have had little information with which to guide reductions in greenhouse gas emissions - and you can't reduce what you can't measure. With Hestia, we can provide cities with a complete, three-dimensional picture of where, when and how carbon dioxide emissions are occurring." The researchers sourced information from various sources, including air pollution figures, traffic counts, and tax assessor parcel data. The details are then placed in a modeling system to estimate CO2 emissions down to individual buildings and street segments. The team used Hestia on the city of Indianapolis, Indiana, and are planning to cover Los Angeles, California and Phoenix, Arizona. They hope to go on and map CO2 emissions in all major US cities, which make up nearly 25% of global CO2 emissions. The researchers believe the detailed information can help society make vital decisions about reducing climate change. ASU President Michael M. Crow says, "As a community, we must take a leadership role in sustaining our relationship with the environment. This research, and its implications for global engagement regarding climate change, is an exciting step forward. Hestia gives us the next tool we need to help policy-makers create effective greenhouse gas legislation." Kevin Gurney, Hestia's lead scientist, says, "These results may also help overcome current barriers to the United States joining an international climate change treaty. Many countries are unwilling to sign a treaty when greenhouse gas emission reductions cannot be independently verified." The extra detail and accuracy that Hestia possesses will help cities discover the best way to make energy and greenhouse gas savings. The Mayor of Phoenix, Greg Stanton, says, "Leading in sustainability is not easy; however, as Mayor, I am committed to doing so. Undoubtedly, Hestia will be a good tool to help us make more informed decisions as leaders in Phoenix and the Valley around issues of air quality, health and a sustainable future." Kevin Gurney believes Hestia helps concrete, positive steps towards mitigating climate change. "Hestia offers practical information we can use to identify the most cost-effective ways to reduce emissions and track progress over time. Scientists have spent decades describing the seriousness of climate change. Now, we are offering practical information to help do something about it." The three year project was financed by Purdue Showalter Trust, Knauf Insulation, and the National Institute for Standards and Technology. The Hestia researchers are Bedrich Benes and Michael Abdul-Massih from Purdue's University Department of Computer Graphics and Technology.